A very typical sight across the English countryside in mid to late August is that of hay bales spaced out in fields and across hillsides and it is one that I deeply love, not least for being something that signals to me that I am back home amidst the very familiar after our travels. Before we even went away this year, I had sighted quite a few of these peculiar tube-shapes in fields near to home; sufficient to inspire me to set to work on my most recent painting, “Hay bales on hillside“, which echoes a much earlier painting of mine from 2008 (and its always an interesting experience returning to a subject that you’ve worked on before and seeing where else you can go with it). In particular, I associate hay on hills with the vast expanse of rolling countryside around The Ridgeway in Oxfordshire and, as we drove over that ancient landmark just a few days ago, shortly after our return from Italy, I was comforted to see the hay spaced out as ever at this time of the year – looking like so many fuzzy cans of food laid out by an obsessive-compulsive giant. 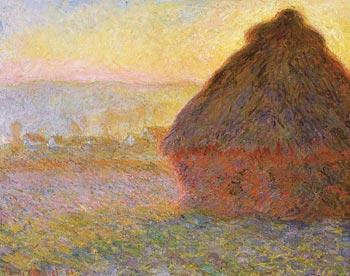 The geometric precision of these forms don’t quite have the same rustic charm as Monet’s haystacks (above) but we have to move with the times and, in their own way, I find them an appealing subject against the foil of randomly undulating fields and one that is just begging to be painted! Posted on August 29, 2012. Share on Facebook, Twitter or Pinterest.